M-Team chairman Jui-Mu Hsieh (left) presents the ‘Top Best Supplier’ award to John Pien (right), Grundfos Taiwan’s plant director. The award ceremony was held in conjunction with M-Team’s annual general meeting. The Taiwan Machine Tool Manufacturers Alliance (M-Team) has recognised Grundfos Taiwan as ‘Top Best Supplier’ for the third consecutive year. 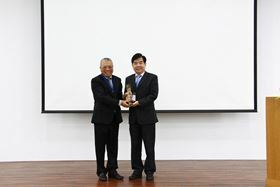 After winning the ‘Best Supplier’ award for three consecutive years in 2014, 2015 and 2016, Grundfos Taiwan was first conferred as ‘Top Best Supplier’ in 2016, and then again in 2017 and 2018. The ‘Top Best Supplier’ award was inaugurated in 2016, with the aim of recognising outstanding suppliers who have won the ‘Best Supplier’ award for three consecutive years. Grundfos Taiwan consists of two companies, Grundfos Taiwan Operation and Grundfos Taiwan Sales. The Grundfos Taiwan Operation was set up in 1989, as the first Grundfos Group production site in Asia. Located in the Tongluo Industrial Park of Miaoli County, Taiwan, the factory produces more than 400 000 pump units annually, supplying the local market as well as Japan, South Korea, China, India, Australia and ASEAN countries. Grundfos Taiwan Sales was established in 1992. Headquartered in Taichung, Grundfos Taiwan Sales has two branches in Taipei and Kaohsiung, and one service centre in Miaoli. Grundfos Taiwan provides energy efficient pumping solutions for various applications across diverse segments including domestic & commercial buildings, industries, and water utilities (water & wastewater management). The environmental impact of pumps is becoming increasingly important for customers.